A desktop conversion of an iPad synth; an effect that used to be chargeable but is now free; and a vinyl emulation that can crackle up your sound. 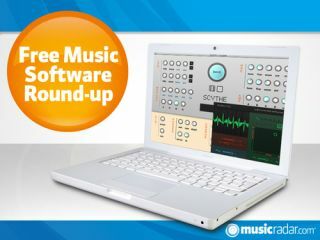 That's how things are shaking up in the world of free music software this week. It's slightly unusual to see an iPad app being brought to the desktop, but that's pretty much what's happened here. Scythe is a synth that borrows its engine and interface from GrainBender. Its oscillators sport analogue and digital waveforms, while there are also modulation options and effects. This 'audio-controlled synth' (though strictly speaking it's an effect) is now free. The plug-in is based on a multi-waveform oscillator with up to six voices, with the parameters being modulated with the input signal's dynamics. There are effects, too, the end result being a device that can help you to produce all kinds of glitches and noises. Give your music a bit of crackle with this vinyl record player emulation. You can adjust the dust count, colour and level, set how much you want to 'age' the recording and dial in a bit of gentle distortion.